Attorney General Greg Abbott leads state Sen. Wendy Davis by 12 percentage points in the race for Texas governor, according to the latest University of Texas/Texas Tribune Poll. Republican Greg Abbott leads Democrat Wendy Davis by 12 percentage points in the race for governor, according to a new University of Texas/Texas Tribune Poll. That result is close to the 11-point spread, also in Abbott’s favor, in the February UT/TT Poll. In this most recent survey, he maintained a 14-point lead among male voters and a 10-percentage point lead among female voters. 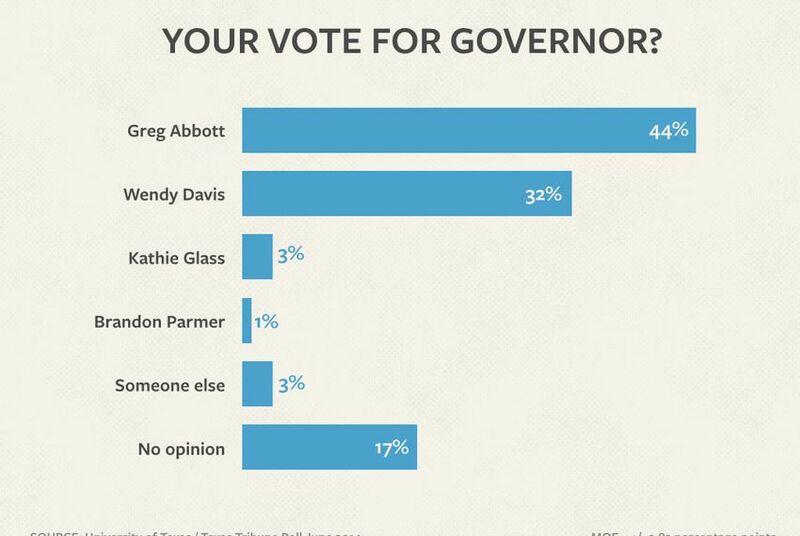 Abbott has the support of 44 percent of the voters surveyed. Davis had 32 percent, Libertarian Kathie Glass had 3 percent, the Green Party’s Brandon Parmer had 1 percent. Another 3 percent chose “someone else,” and 17 percent said they had not formed an opinion. 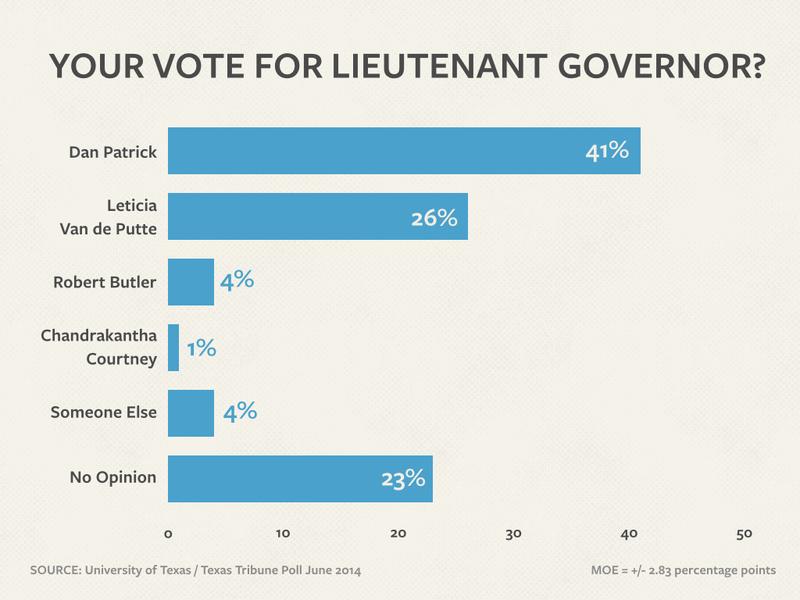 In the the race for lieutenant governor, Republican Dan Patrick has the biggest margin in the pack of statewide races, leading Democrat Leticia Van de Putte 41 percent to 26 percent, with 23 percent undecided and the remainder going to third-party candidates and unnamed candidates. Patrick finished a heated runoff with Lt. Gov. David Dewhurst shortly before the survey was conducted, while Van de Putte, who did not have a primary opponent, had been relatively quiet and remains less well-known. In hypothetical primaries for president — an election that is two years away — Texas voters like Republican Ted Cruz and Democrat Hillary Clinton. 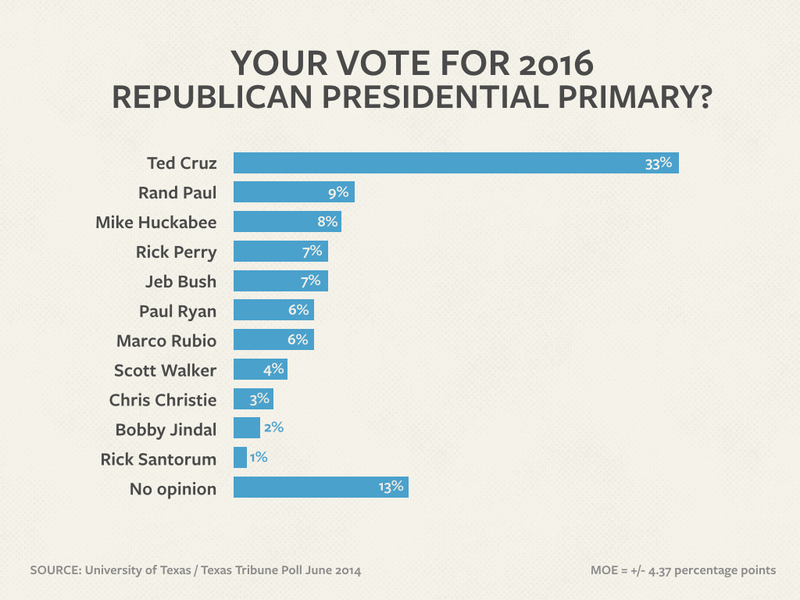 Cruz led a pack of Republican prospects with 33 percent of the Republican voters’ support. Nobody else got into double digits; Cruz was followed by U.S. Sen. Rand Paul of Kentucky, former Arkansas Gov. Mike Huckabee, Texas Gov. Rick Perry and former Florida Gov. Jeb Bush. Only 13 percent of Republican voters said they have not formed an opinion about who should be the nominee. 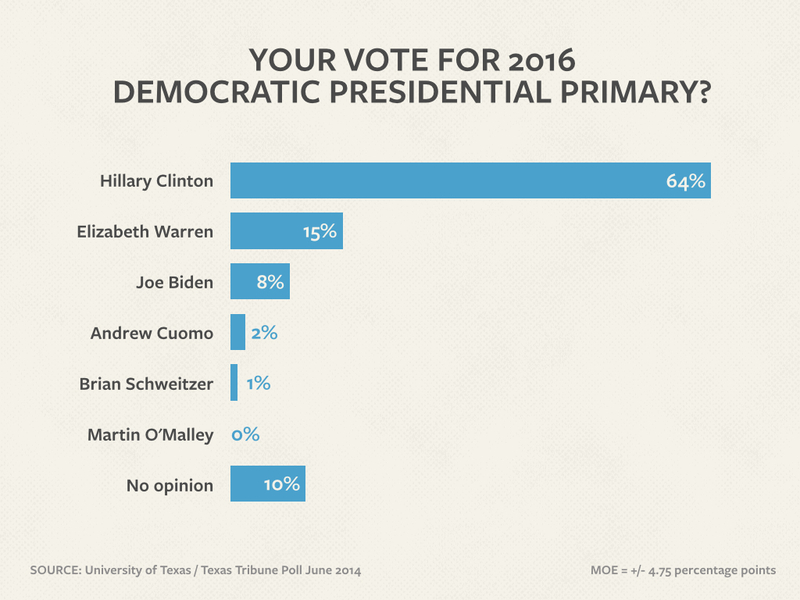 Clinton was even stronger on her party’s side, with 64 percent of the Democrats behind her. U.S. Sen. Elizabeth Warren of Massachusetts got 15 percent, and Vice President Joe Biden got 8 percent. Just 10 percent of Democrats were undecided. • In the race for attorney general, Republican Ken Paxton leads Democrat Sam Houston 40 percent to 27 percent, with 27 percent undecided. Libertarian Jamie Balagia and Green Jamar Osborne each have 3 percent. • Republican Glenn Hegar leads Democrat Mike Collier 32 percent to 25 percent in the contest for comptroller of public accounts, followed by Libertarian Ben Sanders at 5 percent and Green Deb Shafto at 2 percent. In that race, 37 percent said they had not formed an opinion about their vote. • In the race for land commissioner, Republican George P. Bush leads Democrat John Cook 36 percent to 25 percent, followed by Justin Knight, a Libertarian, at 6 percent, and Valerie Alessi from the Green Party at 3 percent. Thirty percent of the voters were undecided. • Republican Sid Miller leads Democrat Jim Hogan by 8 percentage points in the agriculture commission race, with 32 percent to Hogan’s 24 percent. The Green Party’s Kenneth Kendrick got 5 percent and Libertarian Rocky Palmquist got 4 percent in that race. The remaining 34 percent were undecided. • The numbers in the race for railroad commissioner were similar: Republican Ryan Sitton, 32 percent; Democrat Steve Brown, 24 percent; Libertarian Mark Miller, 6 percent; and Green Martina Salinas, 4 percent. The other 33 percent have not picked a favorite. 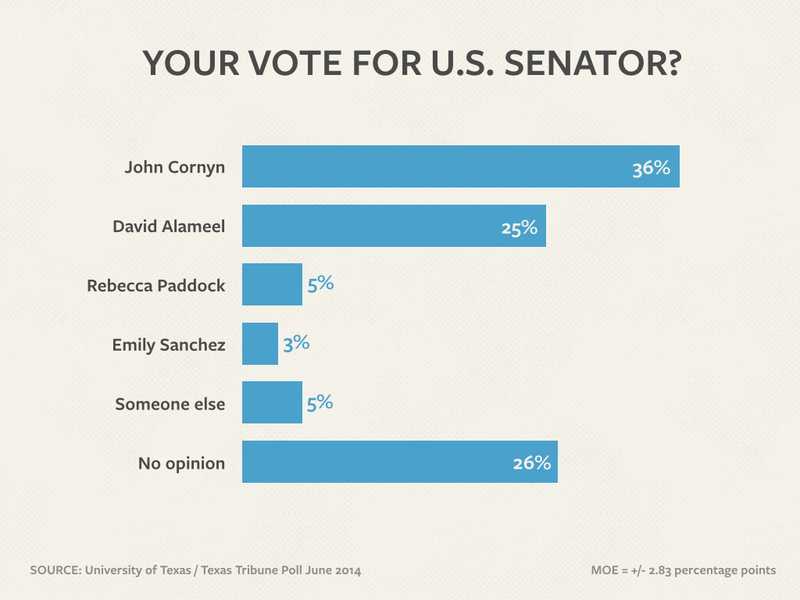 This is the first of several stories on the latest University of Texas/Texas Tribune Poll. Tomorrow: Texans’ views on various officeholders and candidates, on the state of the state and the country, and on the Tea Party.